October 15th in Premium Themes, Themes for Businesses, Themes for Real Estate Pros by Wordpress Jedi . As someone who’s been involved in the real estate business for quite a while, I have had the pleasure of reviewing many real estate WordPress themes in the past. Whether you are a real estate agent or a broker hoping to take your business to the next level, you need a website that looks professional and will leave a lasting impression your visitors. After all, who would want to deal with an agent that has a terrible looking website. A lot of real estate agents that I have talked to just assume that you have to spend tens of thousands of dollars to get a real estate website up and running. But in reality, you can use WordPress in conjunction with a top real estate theme to build a killer website. What you do want to do is choose a theme that is easy to use and customize. Most real estate themes do not know too much programming, which mean a theme that would require you to write the least amount of code is probably more ideal for real estate professionals. Smooth is just the theme. It’s a very good looking and clean WordPress theme that is designed for real estate agents and brokers who run a multi-agent business. The theme is designed for those who want to promote their home listings online and generate leads via online marketing channel. Smooth Real Estate theme comes with a lot of bells and whistles. It comes with a gallery at the top that you can use to promote your top homes. It also comes with a calculator that your visitors can use to determine their monthly payments. And who can forget about the enhanced search functionality that makes it easy for your visitors to search through your listings and find the home the suits them the best. The individual pages come with their own bells and whistles. For starters, you can create a gallery based on the images that you have gathered from the properties you are hoping to sell. 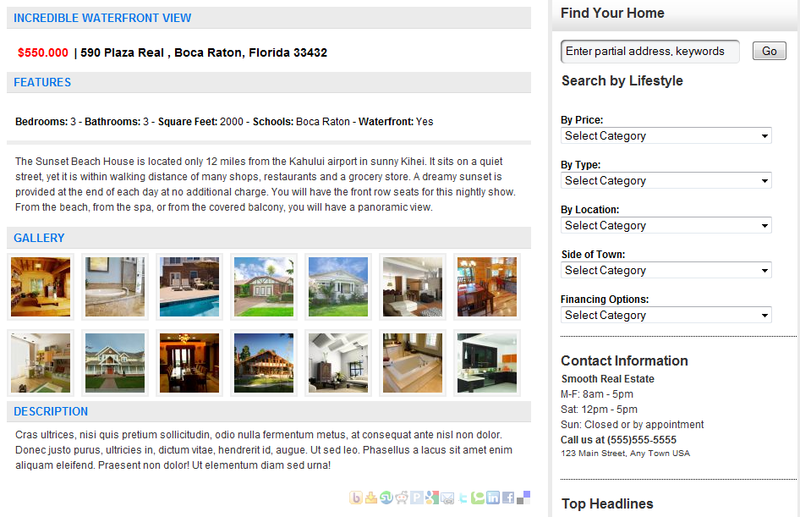 You also get to display all the proper information your visitors need to make a knowledgeable decision about your homes. The theme is social media ready as well so your visitors can share their favorite houses on StumbleUpon and other sites. 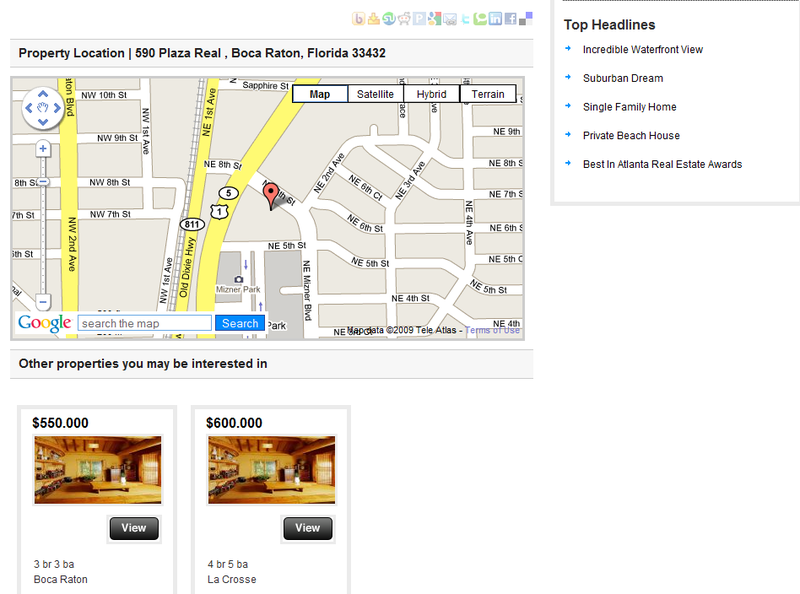 Smooth Theme also comes integrated with Google maps, so your visitors can locate the property they like easier. 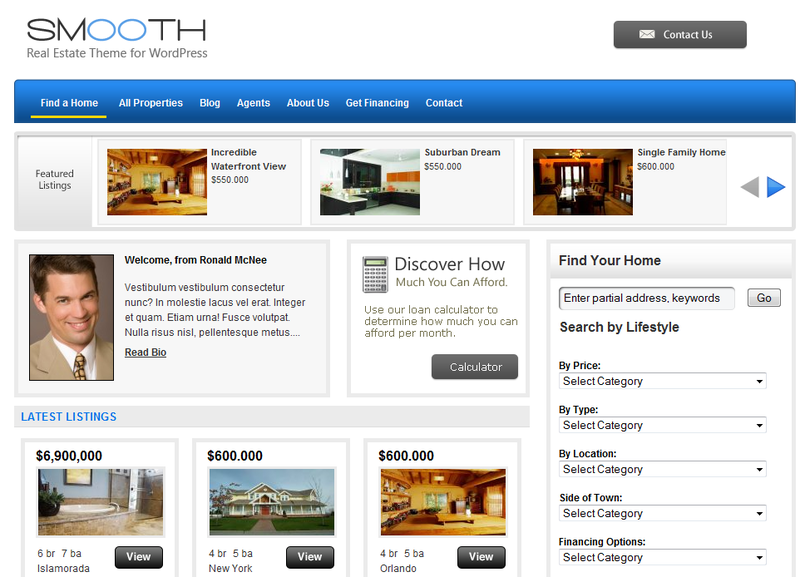 All in all, Smooth WordPress theme is a very high quality design for real estate professionals who want to take their real estate business online. It’s fast to implement and requires no programming on your side. And it doesn’t cost a fortune. If you are a real estate professional hoping to expand your business by using online marketing tactics, you should give Smooth a try.